Preheat oven to 375⁰F. In a large bowl, thoroughly mix butter and 2 cups of crushed Salted Caramel Pieces. Press into springform pan. Bake for 7 – 10 minutes; remove from oven and let cool completely. Beat the cream cheese until smooth, then beat in the sugar and fold in the whipped cream or topping just until fully combined; spread on top of the cooled crust. Top the cream cheese mixture with the strawberry pie filling. Refrigerate until completely chilled. When ready to serve, remove from pan and pipe whipped cream or topping all around the top edge of the cheesecake. 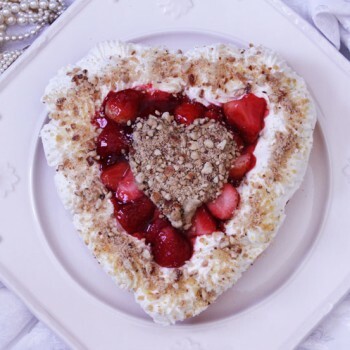 Sprinkle remaining crushed Pieces into a center heart shape as well as a light sprinkle on top of the piped whipped cream.